Tuna steak for dinner? Yes please! 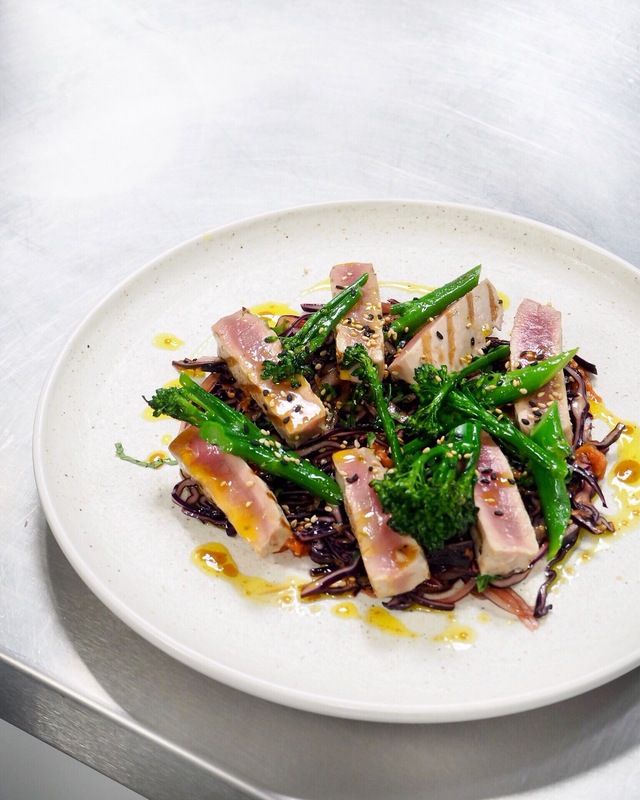 Who doesn’t love a nice tuna steak? Well, if you asked me about 10 years ago, I would have probably raised my hand (weird, eh?). Growing up in Romania, fresh fish was rather a treat for us during my childhood, and for many years all I ever knew about tuna was that it comes in a can. And that it is rather bland. But things have changed since. Seven years ago I moved to London and found here what I call ‘the fish heaven’. If you follow me on Instagram, you probably know that cooking fish is my new obsession. And how could it not be – with so many varieties of fish available here. Over time I’ve been pretty much experimenting with every fish that I found in supermarkets. I even made a night trip to Billingsgate fish market – the place where most London restaurants source their fish from. Here is where I first bought fresh tuna. Oh, I can still remember that excitement when I got home and cooked it. Besides cooking my own dishes, there’s nothing I love more other than watching great chefs cook and learning from them. I have always believed that as a chef there is no such thing as ‘I know it all’. There’s always something new to learn form other chefs but also from people around us. The Great British Chefs Cook School is a great opportunity to learn from some of the greatest chefs in Britain. 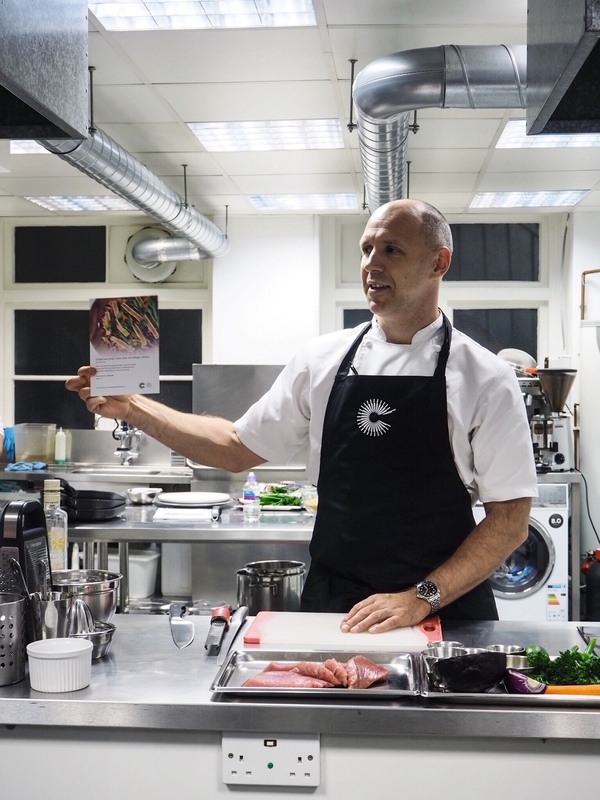 At last week’s event I met Adam Gray – the executive chef of Skylon Restaurant in London. I absolutely loved his passion for healthy food and his no-nonsense approach to cooking good food. The cooking lesson was all about respecting the ingredients and making an exquisite dinner that not only looks good on a plate, but it is healthy and above all, full of flavour. Mix the finely sliced red cabbage and red onion with the grated carrot in a bowl. Make the dressing by mixing the soy sauce, rapeseed oil, honey and the zest and juice of a lime. Season with salt. Add half of the dressing to the coleslaw and mix thoroughly. Season the tuna steaks with salt and pepper, then rub with rapeseed oil. Fry on a very hot pan for 2-3 minutes on each side. Set aside and slice into 3-4 strips. Fry the tender stem broccoli in the same pan for about 5 minutes, rotating every 1-2 minutes to cook evenly. 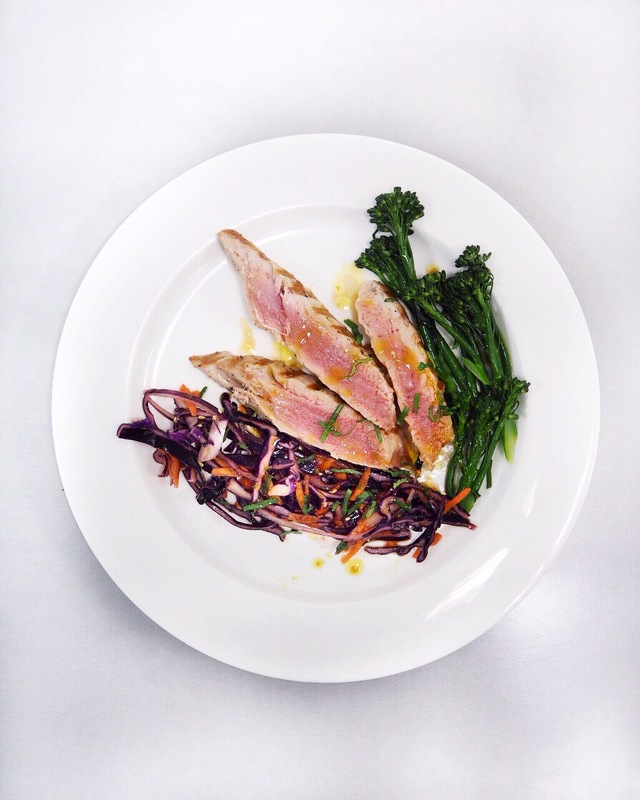 To plate, place the coleslaw on a large plate, add the tuna and tender stem broccoli. Finish with the remaining dressing and sprinkle sesame seeds on top.